jason in jersey: 47°F and Freezing! So Jocelyn's softball game is at 9am here and it's cold! It's only mid-October! What's up with this weather? ¡No entiendo! Joce just made an amazing outfield catch and the other team is impressed! Unfortunatly she was up to bat right after she caught that last out and they got her out. 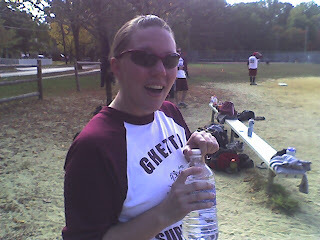 The second time she got up to bat she got a good hit and just ran in to score. The other team started off well, but we're now up something like 7-1. Let's keep this going!